Even after several months, no clear answer to Rosanna’s question had emerged. It seems that what is happening is a “self-organizing” kind of phenomenon; set a direction, create an empowering environment, and watch as others around us begin to “step up” to make things happen. It allows us to see who naturally or intrinsically is a self-starter. It can also allow us to see who tends to emerge as a task leader in an informal setting. A sense of ownership develops among those who do step up and make it happen. It can allow for a natural adaptation to the new current situation’s opportunities/challenges without a formal evaluation and decision making process. It tends to prevent micro managing. Self-organization also has its downside: those who do not step up around the priorities tend to watch from the “sidelines” because they don’t feel a need to jump in. Since there are already people doing that work they feel their participation is not needed. What do they do instead? It depends. But often what they do is not aligned with the organization’s priorities or isn’t even on the organization’s priority strategy or project list. This tendency for people to stand aside because they perceive or assume that others have stepped up to work on the priorities is often evidence that “diffusion of responsibility” has occurred. DoR, diffusion of responsibility, is normal. It occurs when some need is present that will take one or two people’s time to resolve in some fashion. As the number of people increases who see the need, people assume that someone else has already or will shortly step up to the issue and help get it resolved. The assumption’s probability of being wrong increases as the size of the group that perceives the need increases. Recently, the aforementioned board formally reviewed their progress on the nine priority projects that it had identified six months earlier. What it found dismayed the group. Only three of the nine priority projects had people who had stepped up to work on them. Some members thought that this was an indicator about how much each board member cared or an indicator of each person’s commitment. The problem with that conclusion is that self-organizing methods used on multiple projects lends itself to people making erroneous attributions about who is responsible for what and what their level of concern for the issue is. As the number of projects increases and the complexity of each increase, DoR is more likely to occur. Fortunately, what we know is that this DoR phenomenon is not an indictment of people. It does not signify that people are intrinsically lazy, uncaring, or uncommitted. It just says that the more people involved, the less any one of us feel responsible for any given need we all collectively perceive. And often we will move on, confident someone is taking care of it, and do something else. To support this view, the board found that there were several projects that were being worked on that the board as a group had not considered, prioritized, or sanctioned. Why? It appears that people who consider themselves to be caring and responsible will identify what they think are priorities and initiate action to deal with these items, especially if they perceive that they are not needed for what another individual or group is already working on. We could conclude that people do care. We could conclude that people do want to feel they are responsible people. And if they assume that others are working on priorities and that they are not needed, they will work on their ideas of what’s important. You know, this diffusion of responsibility thing isn’t limited to board rooms. 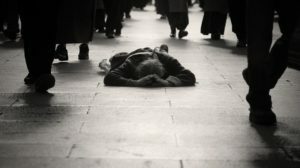 Many stories are told of how people walk around a person stricken and laying helpless on a crowded sidewalk. And for those who do stop, they try to comfort the person assuming that 911 has been called. And of course, the person continues to languish and sometimes dies because somebody assumed that somebody else had dialed 911. This DoR is not limited to crowded city sidewalks or dark alleyways. It can happen within families regarding household chores, management teams where strategy goes unexecuted, ad hoc project or task forces that fail, baseball teams when the fielders assume the other guy has got it, football defensive backs who assume the other guy has got a receiver covered, at church when the donation plate is being passed, etc. This is just how people are. We make assumptions that somebody else has got it covered especially as the group size increases. So what can we do about this? The bottom line is to ensure that the erroneous assumption that somebody else “is on this” does not occur. If you see someone on the sidewalk, assertively assist that person. If you need someone to call 911 while helping that individual, look another person in the eye and ask them to call 911. Make them commit to it. This prevents that erroneous assumption that somebody is taking care of the 911 call from taking hold. If you’re on a management team and want to ensure the success of a project, make sure that there is a leader per project who knows and accepts the responsibility for the project. If you have to, look them in the eye and ask a person to formally to take on that responsibility. Get their commitment. It prevents this insidious assumption again from corrupting movement forward on their projects or strategy. And if the project lead wants to create a self-organizing situation, that person can create a team that self organizes around the project’s objective. And they can document their self-organizing work with a project charter and a time anchored action plan that communicates their projected path to project achievement that makes clear their roles and responsibilities and prevents the diffusion of responsibility from occurring. Diffusion of responsibility will always occur. It’s is a normal human attribution error that occurs as the group seeing the issue grows in size. In addition, people want the freedom to do things their way and we should let them. And as we do these two things, deliberately create a sense of responsibility by including in that “freedom” a formal commitment to their assigned responsibility and, if appropriate, a commitment to document their approach with a project charter and action plan so you know that formal acceptance of their role and their responsibility has occurred. Assuming that somebody will take total responsibility and ownership for a situation even when there are lots of others around will come back to haunt you later. When you notice that things are not getting done within your organization because people are assuming others are working on it, call Misty River Consulting. We can help. Donald A. Kerper is the President and Senior Consultant of Misty River Consulting. He is an Industrial Organizational Psychology practitioner based out of Stratford, WI serving clients across the United States.